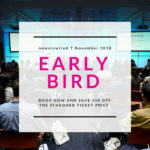 The next newsrewired digital journalism conference will take place on 7 November 2018 at Reuters in Canary Wharf, London. This will be our 23rd conference and, as usual, we are aiming to provide delegates with practical skills and ideas they can take home and explore in their own organisations. We are currently working on the programme, and details about sessions and speakers will be announced soon. A limited number of early-bird tickets are now available. Tickets to next week’s news:rewired digital journalism conference have sold out! But if you didn’t manage to get a ticket for the one-day event on 23 July in time, don’t worry – you can still buy a digital ticket that gives you access to videos of the workshops and sessions that will take place on the day. The event takes place on Wednesday 23 July at the MSN UK office in Victoria, and we will aim to have the videos available to view within a week of the conference. Digital tickets cost £100 +VAT. Buy yours now at this link. Digital tickets are available in partnership with BlackRook Media.